Congratulations!! I am thrilled that you are going to publish this. It is hard to find a title that has not already been worked to death, isn't it? I like the one Darkness Into Light..it feels the most 'uplifting' to me. As you know my nephew was a sufferer and chose to put an end to his misery. I do so wish there had been a light at the end of the tunnel and some Hope for his future but it was not to be. I am thrilled that you are writing this book and give thanks for all those that you could potentially help. From Darkness into Light Hope for the Future From a Fellow Sufferer. Stay well and know that you are loved. Your Dark Night: This, too, Shall Pass 🙃 Gee, this is tough! I can see the dilemma. I noticed right away the crossing out of those negative words. If I saw them in a title, I’d not be inclined to read. I think it is a wonderful thing you are doing and I wish you all the best. So excited for you! My vote is for, "From Darkness into Light: Hope for Those Struggling with Depression"
It's exciting that you're writing a book that will help others. I think as you continue writing the title may come to you. 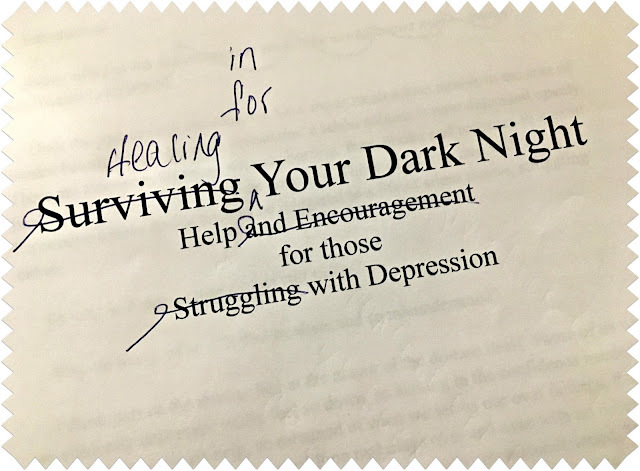 What about skipping the extra words and calling it Healing Your Dark Night: Hope for those struggling with depression. Oh Deb, how wonderful that you are going to publish your book! I like the title "Hope in Your Dark Night" the best I think. I have a friend who is a blogger that used to have blog about her battle with depression. She titled her blog "The Upside of Down" which I thought was a great title too. I have no doubt you will get it just right because your blog is so beautiful. Keep us posted how things are going! Hi Deborah! Oh my, I am thrilled for you to be sharing your journey, which will inspire and help people with depression. I think I like From Darkness into Light as the title. Best of luck, my friend, in self-publishing your book. Wow that's a tough job...it's like finding the perfect name for a baby! How about "light a candle in the dark...and find your way out of depression." Sweet friend, I am so excited to hear you have been working on your book and I know by you sharing your journey others will be blessed and encouraged. As for the title....I know whatever you decide will be perfect. I personally like option #3 "From Darkness Into Light." I know it can be difficult deciding on a title since I have trouble with simple blog post titles - HA! I had to smile when I saw your marks on the title as my son has been writing several book reports and his papers look just like that. Thinking of you, dear one! Love and hugs! I like #5 the best. I wish you all the best as I know this will be helpful to many. Picking a catchy title is never easy and no doubt, you will not be the first author on the subject! For me I would go for a top line like: There is Light at the End of the Depression Tunnel - It will draw people more into reading more. Choosing a book title is a hard thing. I like the ones that imply a shifting of perspective and healing. But not "Healing your Dark Night" - to me, that personifies Night and somehow detaches it from a personality. Does that make any sense? Darkness into Light is the one I like best. Good for you, Deborah! I am so proud of you. #1 is my fav of the list you provided. #2 is just a bit TOO basic. 4. Again, a little TOO basic - sounds almost clinical. 5. I do like this one second - though I can't help but think of The Dark Knight (and we know that actor died a young death, so it brings negativity to my mind. Let me sleep on this. Again, I am so amazed you can do this. Let's talk soon, once my voice comes back. I like the titles that mentioned "hope", because truly there is hope in this. Can't wait to read the book myself! I like the ones that mention "hope" because there is hope for those who struggle with this. I can't wait to read your book myself! what an amazing thing to do! a good tip for a title is: what was your inspiration for writing this? what message did you want to give others? your heart will tell you. Best wishes. Not sure what to say here : ) "The one on depression that I ended up being too depressed to finish"
"Walking through Depression's Struggles into Light" and another one, "Walking in the Tunnel of Depression, with Light for Today". I wish you the best of grace and God's help as you put this project into a greater purpose to help others! I read your post a few days ago but wanted let the potential titles percolate for a bit...I'm also leaning towards "From Darkness Into Light". Best wishes in your work to help those struggling with depression. I like #1 best. The use of the word "your" reaches out to the reader and draws me in. And "Healing" is more appealing that "Hope" because it seems more tangible. I also like #4, again because it seemed more "solid" - not just fluffy words, but real information.